The establishment of Hello Home Doctor Service Ipswich came about from an idea at a local networking event where members of the healthcare community were discussing the lack of access to available after-hours service in the Ipswich area. It was identified that there was a great need in the Ipswich Region for an effective home visiting Service that also services the outer Ipswich areas. As a result, Hello Home Doctor Service was established in 2016 to provide to the region a locally operated, independent and dedicated home visiting doctor service providing timely access to after-hours care within our community. Hello Home Doctor Service Ipswich is a fully accredited Medical Deputising Service provider. We offer an after-hours home visiting Doctor service to Patients at their home or an aged-care facility on behalf of the Regular GP. A patient report is completed for every patient seen by a doctor from Hello Home Doctor Service. We send a copy of the patient report to your nominated general practitioner for their records. To help us keep your medical care continuous, we ask that you have the name of your general practitioner or medical center available at the time of making a booking to see a doctor after hours. All calls will be triaged as per the Department of Health guidelines and Patients requesting a visit for clinical matters that are outside the scope of deputized care will be referred to regular GP for follow up care. 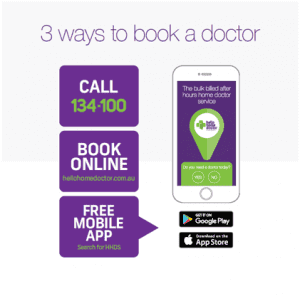 Hello Home Doctor Service Ipswich has remained focused on our Mission to deliver outstanding care in the after-hours within our community and to “bring back the old-fashioned Home Doctor”. 134-100 Hello Home Doctor Service is your local and independent home doctor service. Our Service is continuing your GP care in the After Hours.